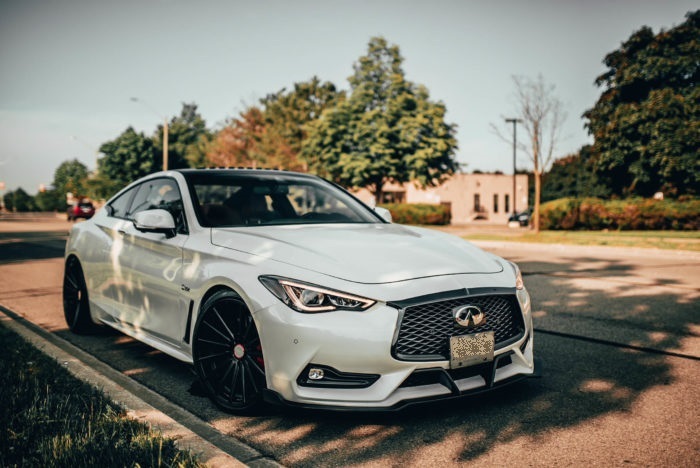 Circuit Motorsports: Flat-Out: Infiniti Q50 and Q60 Dyno-tuning with EcuTek - How much Boost? Stillen is a very well known tuning house out in California, and they have been respected in the Nissan game for a very long time. When the VR30DDTT was released Stillen did a lot of their own research to determine the best turbo efficiency range. They posted this data and this was useful as a set of datapoints to use when developing our own tuning strategies. 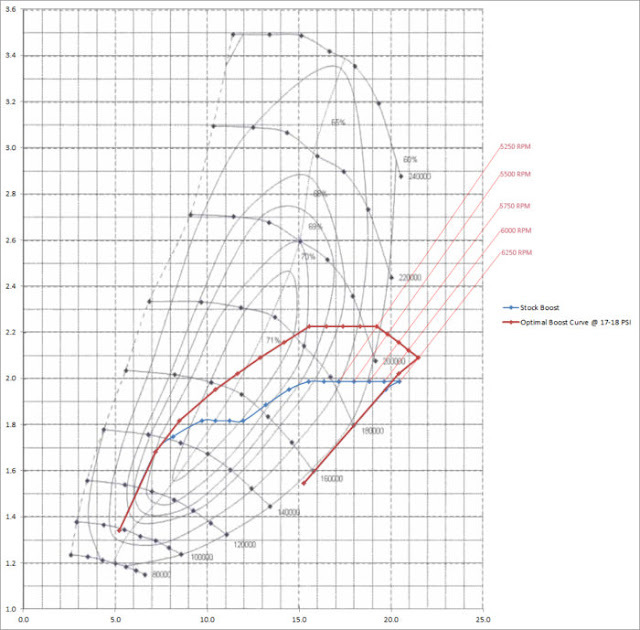 What they found is that peaking boost around 18 psi and tapering to 15-16 psi at redline is the most efficient boost range for the turbo/engine setup the VR30 utilizes. We've confirmed this through our own tuning but also by researching what other VR30s are making at different power levels. We recently ran an FBO Q50 RedSport on a Mustang dyno with a competitor's e-tune, along with Burger Motorsport intakes, AMS lower downpipes, Magnaflow exhaust, and a Frozen Boost heat exchanger. With full bolt-ons and the other shops e-tune, this car made 418whp and 486wtq at 23-24 psi (this is a lot of boost for the stock turbos). 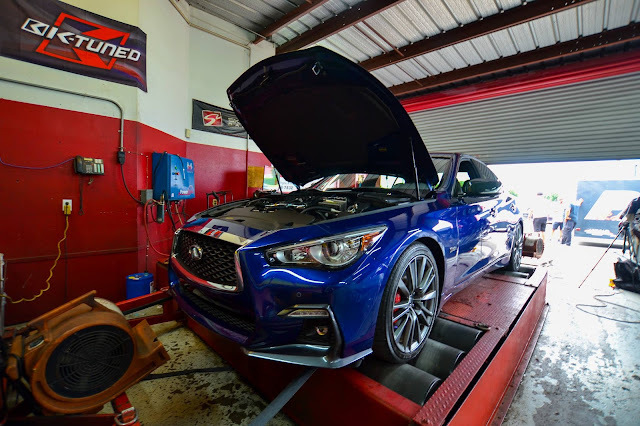 In comparison, we ran a bone stock Redsport on the same dyno just days before (very similar weather and conditions) with no modifications, just our own custom Ecutek tune, and we were able to achieve 409whp and 474wtq! That is less than 10 horsepower difference with NO mods, just our tune! So with the above reference, at 18psi we're making almost as much power as the competitors tune is at over 20+ psi, all while putting less stress on the turbos and drive-train. Our tune is clearly ideal, as you don’t want to sacrifice having a safety margin on your engine for less than a 10hp gain. The harder you push turbos, the hotter the air is going to be entering your combustion chambers, and the higher the likelihood for engine killing detonation. It’s for this reason we would much rather make 418whp at 18psi, vs. making only 9hp more with 5-6 more pounds of boost. Our tuning philosophy is to tune a vehicle and make as much power as we can, SAFELY. You can’t always control the environment you’re in; whether that is the quality of the gas you pump in to the tank, the weather (temperature, humidity, elevation), or the general driving conditions. If your car is tuned to the ragged edge of safety just to make a few more horsepower, and you happen to get a bad tank of gas, or it’s a really hot day or both, you could be buying yourself a new engine pretty quickly. So, keep this in mind when looking for a tuner or a shop to modify your car. Are they taking the time to research the platform and tuning accordingly? Are they pushing your engine to the max just to show a little more power on the dyno screen? 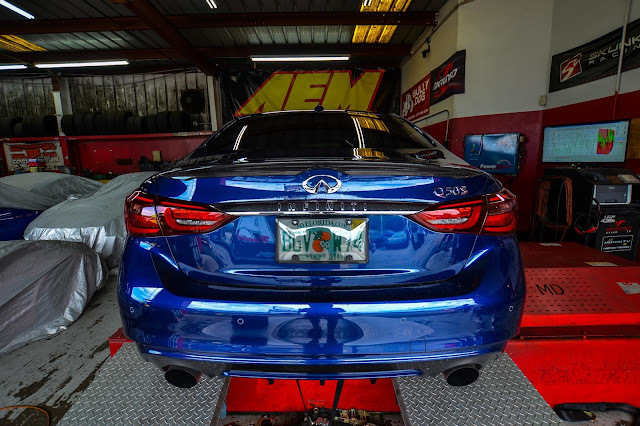 At Circuit Motorsports make sure when we are dyno tuning the Infiniti Q50 Q60 platform to leave a bit of safety for our customers! Circuit Motorsports is a performance auto shop located in Orlando, Florida. We specialize in performance upgrades, ECU tuning, engine builds, and fabrication. If you are interested in performance upgrades, a dyno-tune or e-tune, or a full build consultation contact us today! HELL YEAH thats my car they tuned right there in the pictures, great people and extremely knowledgeable. Knew exactly what to do and how to do it, recommend these guys for any of your tuning and etc. Thanks again guys. 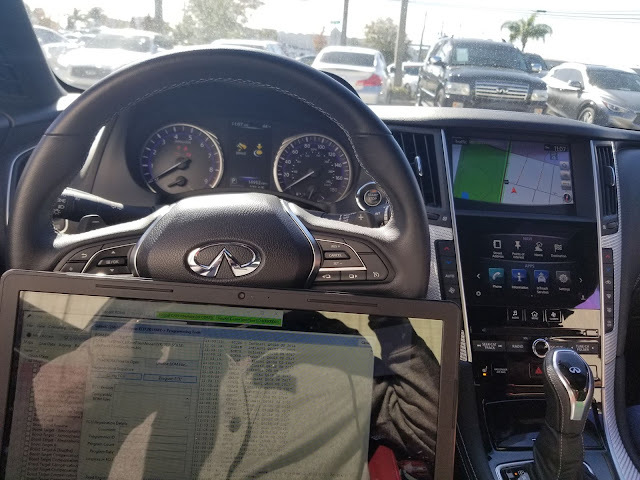 I am living in orlando and i am thinking of getting a tune. do i have to buy ecutek kit first then visit them or just go there and get a tune? how much did it cost? thx.